To say today's families are busy, would be an understatement. Parents are working longer hours and their children are involved in sports, music lessons and a host of other extra curricular activities. Between very crowded calendars and today's pace of life, families have very little margin to just hang out and play with their children. Bottom line - playtime for kids and their parents is getting squeezed out. This is important to know because there is a strong link between families playing together and their happiness. In a study conducted by Edelman Intelligence, it was revealed that 88% of families who play together for five or more hours a week are happier than those who don't. But nearly 30% actually spend less than that on play. Kids want to have more free time so they can play with their parents. 81% of children who were surveyed said they want their parents to play more with them. Parents are in agreement with the benefits of playing with their children. 95% believe play is essential for their child's well-being. 82% think that children who play more will be more successful in future studies and work. 83% of children agree that they learn better when play is involved. 76% of parents rank play as the top educational technique. 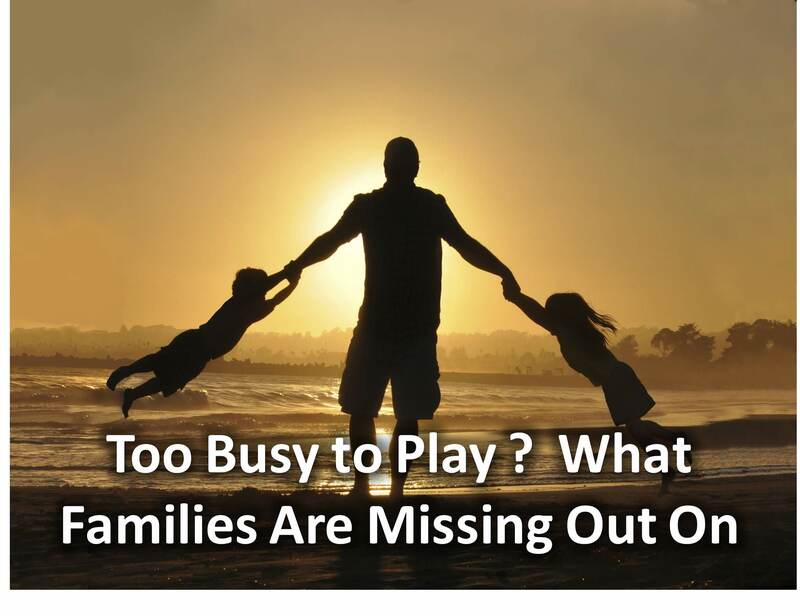 But as mentioned at the beginning of the article, families struggle with prioritizing playtime. 38% admit they struggle with playing with their children. (61% of parents admit they tend to get distracted by life’s other demands, such as work, house chores and their ever-present smartphones. The report draws out a generational shift in play patterns and the concerns that come with these changes. While parents still worry about the safety and sociability of digital play - 88% being concerned about online safety and 72% fearing technology makes children less able to think for themselves - the report reveals the next generation is teaching us all to embrace the unique opportunities that technology brings. Children themselves are pioneering a new type of ‘Fluid Play’ where they naturally engage in play that seamlessly blends real world, imaginary and digital experiences. To them it is simply play. The report reveals that the increased integration of digital layers doesn’t come at the expense of more traditional shared play, as most children (81%) still prefer playing with their parents than alone, and three in four (72%) prefer to play with friends in the same room rather than online. Despite pressing concerns, parents are however showing signs of adopting their children’s mindset with over half (59%) believing technology can bring the family closer together, and three in four (77%) believing digital play can be creative. The power of play to help children learn is indisputable for parents. Almost all (95%) believe play is essential for children’s well-being and a vital educational tool. Four in five (82%) think that children who play more will be more successful in future studies and work. Parents also rank playful learning (76%) as the number one educational technique, over reading books (67%), classroom teaching (55%), interacting with friends (65%) and surfing the internet (22%). More importantly, four in five (83%) children agree they learn better when play is involved. Adults and children equally feel the benefits of playing together. Parents say play is good for their own well-being (91%) and happiness (72%) and that it even helps them feel more relaxed (86%) and connected to their children (64%). Almost all children surveyed say play makes them feel happy (93%) and helps them relax after a long day at school (87%). Inspired by the findings, the report suggests 10 principles for families to consider when playing together. These include encouraging less structured play, embracing mistakes and gamifying household chores. It is noteworthy to mention parents engaging in digital play with their kids. Many digital games are available that kids and parents can play together. Kids love technology and it's a great way to play with their parents online. How can you encourage kids and parents to play together at home with a spiritual purpose? Provide simple games kids and parents can play together at home. Games that will reinforce the main point from the lesson. Host special events for kids and parents where play is involved. An example would be, hosting a mother/daughter banquet with a fun game or two in the event. Or how about a father/son camp out, where you have games involved. We often talk about the challenges involved with extending the lesson into the rhythm of a families' life. And how we can actually get them to engage with what we send home. Perhaps the answer is providing more games for kids and parents to play together. Play the game first at church on Sunday and then encourage kids to get their parents to play the game with them at home during the week. Attach review questions to the game in debrief format. This not only helps parents disciple their children, but also encourages them to spend time playing together. Your turn. The floor is yours. Share your thoughts and ideas in the comment section below.